It's good news for solar advocates and bad news for competitors: General Electric is breaking into the solar business in a major way. In April, GE announced it had built a solar module with the highest publicly reported efficiency rate for cadmium telluride thin film  the most popular low-cost solar technology. The commercial module topped out at 12.8%, according to independent testers at the National Renewable Energy Laboratory  nearly 3 percentage points higher than the industry average. 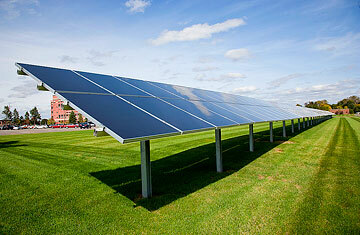 (The efficiency rate is the percentage of the sun's energy a solar panel can convert to electricity.) Those record-breaking solar modules will eventually be manufactured at a U.S. facility set to open in 2013 that will be the biggest solar factory in the country. The news means GE  which already has a wind-energy business worth some $6 billion  could be ready to dominate solar much as it leads the way in wind. "This is the beginning of what we see as a global competition," says Victor Abate, GE's vice president of renewables. Despite GE's experience in the energy business  its founder did, after all, invent the lightbulb  the multinational behemoth will be entering the solar race behind its rivals. Those include Arizona-based First Solar, which began life as a small start-up before investments from John Walton of the Walmart family helped it become one of the most successful renewable-energy businesses in the world, with manufacturing facilities that produce 2,300 megawatts' worth of cadmium telluride thin-film solar modules a year. For now, GE's manufacturing capacity  including the planned new plant in Colorado, which is expected to employ 400 workers and create an additional 600 jobs  still makes it at best a medium-size player in the industry. But GE is GE, and it can bring resources to bear on renewable energy that no other corporation can  as its competitors in the wind-turbine industry already know. In 2002, GE grabbed the wind-power assets of Enron after the energy-trading company went bankrupt. At the time, Enron was the only major U.S. wind-turbine manufacturer left standing. On-and-off U.S. federal support had ceded the lead to European firms like Vestas and Gamesa. Today, though, GE is the third largest turbine maker in the world. "Our wind business was just a couple of hundred million dollars in 2002," says Abate. "Now it's a $6 billion platform. GE knows how to scale." That's exactly what the solar industry needs. Solar power had an excellent year in the U.S. in 2010, growing by a remarkable 67%, faster than any other energy source. The U.S. Energy Information Administration predicts that over the next decade solar generation will expand more than fourfold. But solar can grow so fast, in part, because the market is so tiny: less than 1% of U.S. electricity comes from the sun. For that to change  for solar to become a game changer, not just a rounding error  it has to get radically less expensive. That improvement must come from innovation. Earlier this month, GE announced that a new power-plant design will integrate natural-gas electricity generation with both wind and solar as complements. Though GE has yet to reveal its cost structure for solar manufacturing, the company is confident that its efficient panels  and turnkey manufacturing  will rapidly bring down the cost of solar energy. Mark Little, GE's global-research director, has suggested that within five years solar could be cheaper than fossil-fuel power in regions with expensive electricity. "The leverage we have is our improving efficiency," says Abate. "Once you have a leading technical position, you can scale up and drive down cost." That's the hope, anyway. But the solar business in 2011 isn't the same as the wind industry was a decade ago, when GE began churning out turbines. Chinese companies like Suntech Power and Trina Solar can undercut their American competitors, thanks both to rock-bottom labor costs and steady government assistance of the sort not likely to be coming from Washington. American manufacturers like GE will struggle to beat the Chinese on sheer cost, though the company expects to reduce expenses on solar development by 50% over the next several years, Abate says. GE will need to win instead on innovations that take advantage of the company's scope and its experience at making the right bet at the right time. For all their usual preferences for the small and local, greens should hope for GE's success. If they want solar power to win big, they need the biggest player in the game. See pictures of a solar-powered airplane. See the surprisingly long history of green energy.